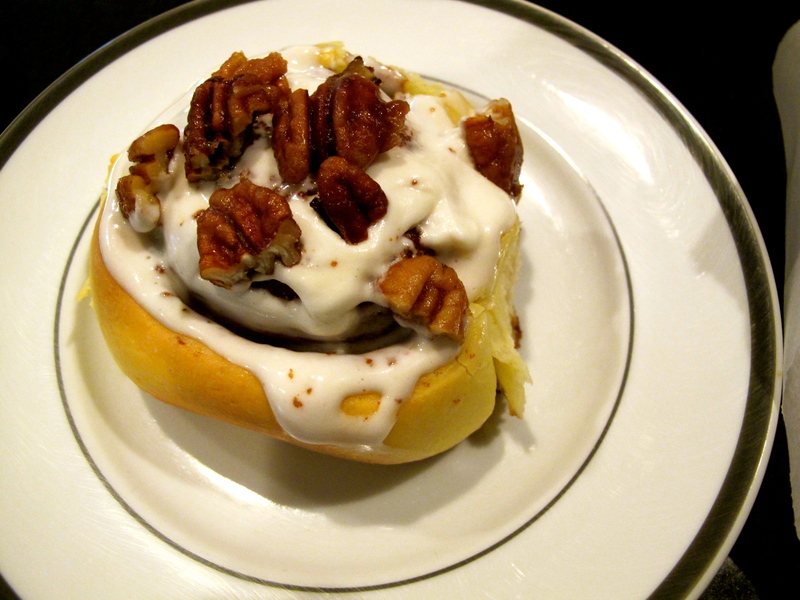 Cinnamon rolls are one of those foods that sometimes you just NEED! As a kid, Pillsbury Cinnamon Rolls were a snow day special treat that we only got once or twice a year. I was honestly surprised my mom even let them in our house with all the yucky chemicals and preservatives. As we got older, and more committed to baking, we started experimenting with different fillings and toppings. I normally prefer sticky buns to cinnamon rolls but I had a friend over for the night and the Pillsbury craving just overtook me. This recipe is based on one from Cooks Illustrated’s Best New Recipes (a must buy cookbook by the way). I switched up the icing because we didn’t have any cream cheese but I think the sour cream glaze below is going to become a repeat because it was so good and not as heavy as cream cheese icing. Put half of the icing on while the rolls are still warm and the remaining half once they have cooled down a bit. The first bit will melt into the crevices and the second smear of yummyiness will be the frosting on the cake – or roll if you want to be literal! As an added topping I flambeed some pecans in butter, brown sugar, and Lairds. Lairds Applejack, for the uninitiated, is an apple-based alcohol that is the secret ingredient in hundreds of recipes! Don’t want to wake up at 5am to make cinnamon rolls for breakfast? Do the leg work the night before! Bake the rolls until they are lightly browned but not golden, let cool, and cover. In the morning you only have to finish them in the oven and then cover them in icing. You can even make the icing the night before. Optional: dried fruit, nuts, etc. 1. Combine warm water and yeast in bowl of stand mixer fitted with dough hook. Let stand till bubbly, about 15 minutes. 2. Heat milk and butter in small saucepan until butter melts. Allow to cool to lukewarm. 3. Add sugar, salt, egg, and egg yolks to mixer. Combine at low speed. Add warm milk mixture and 2 cups flour gradually, alternating between the two. Add final 2 cups of flour and knead at medium speed until dough forms blisters on the surface and pulls clears the sides of the bowl. *Add more flour if necessary 1 tbsp at a time. 4. remove bowl from mixer and oil lightly. Cover with plastic wrap and let rise until doubled in size. 1.5-3hrs depending on temperature. 5. Mix filling ingredients in small bowl. Grease 13″x9″ baking pan. 6. Press dough into a large rectangle using a rolling pin. It should be no thinner than 1/3″. Spread the filling on the dough leaving a 1/2″ border. Roll the dough into a log. Moisten the end with water and pinch shut to seal. 7. Cut the log into 12 equal pieces using dental floss (see photo). Do this by first cutting log in half, then each half into thirds, and each third in two. Place each piece into the greased pan 1.5-2″ apart. Allow to rise in a warm place until doubled in bulk. 8. When risen, bake at 350 degrees until golden brown. 25-30 minutes. 9. Whip heavy cream and sour cream together until soft peaks form. Fold in vanilla and confectioners’ sugar and whip to desired consistency.